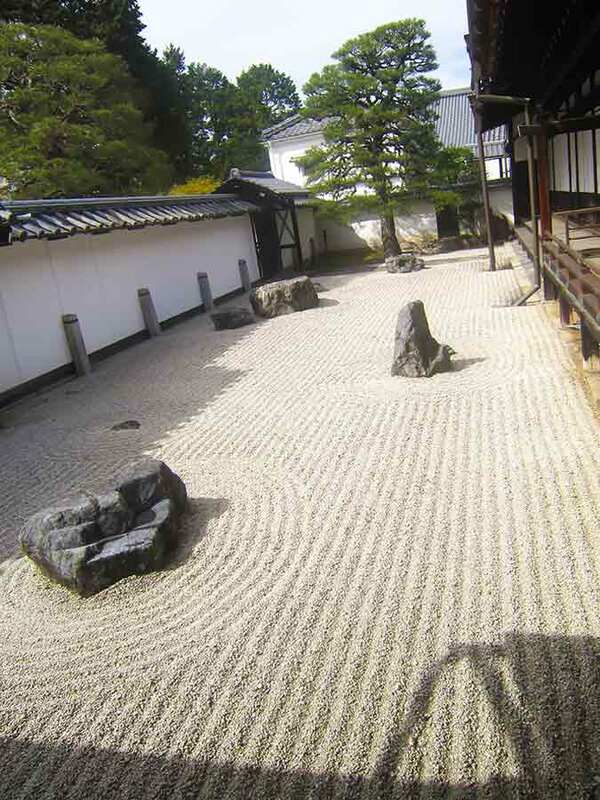 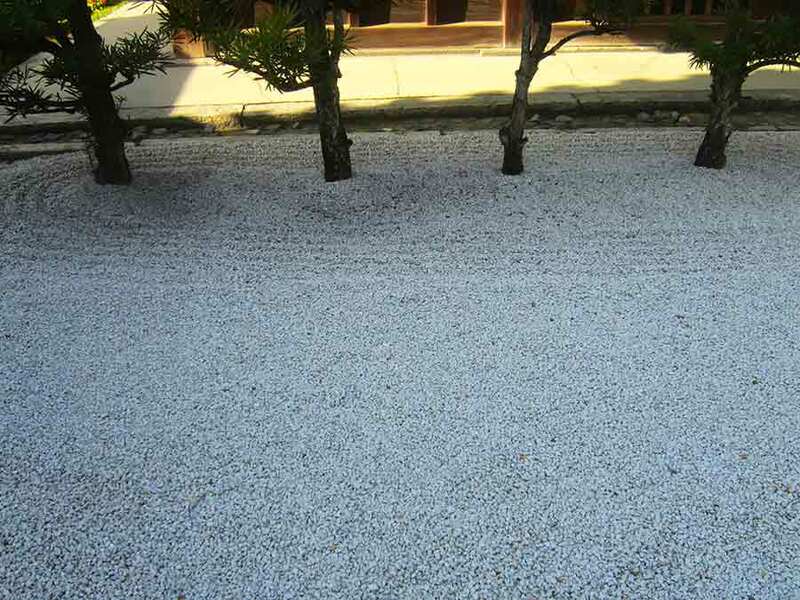 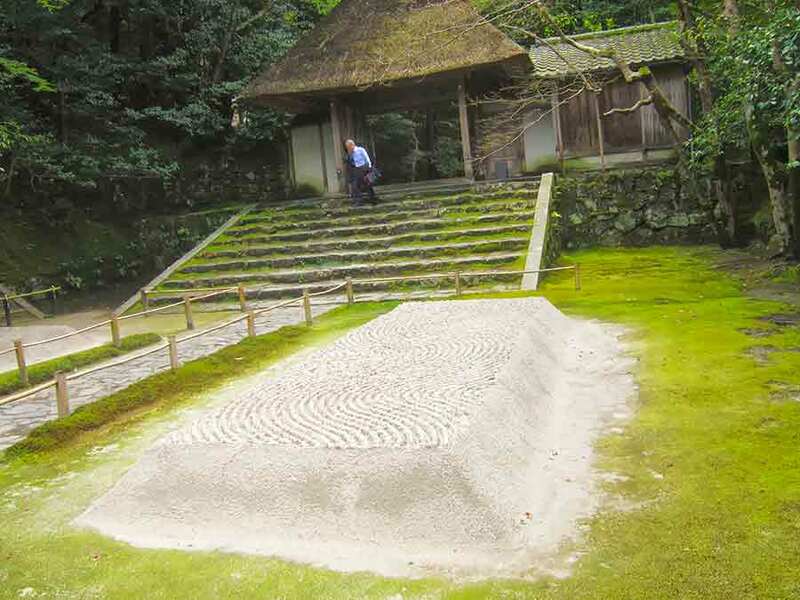 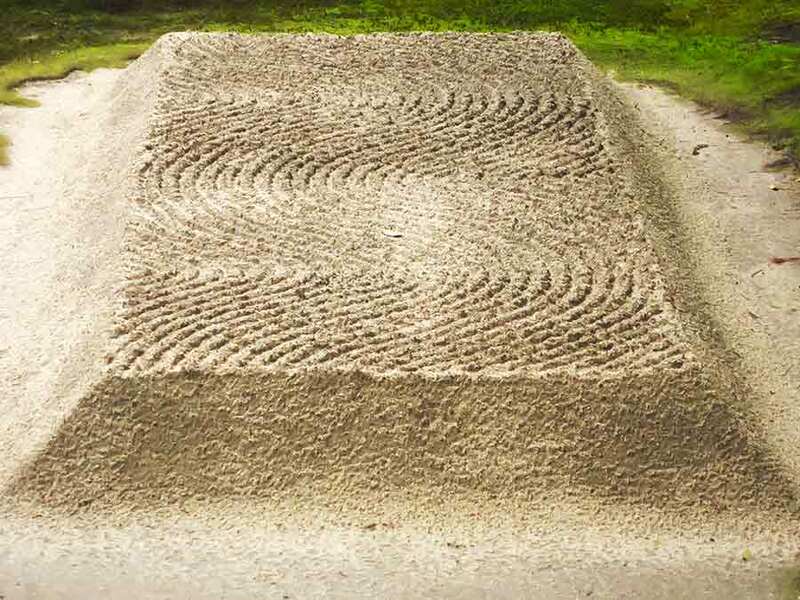 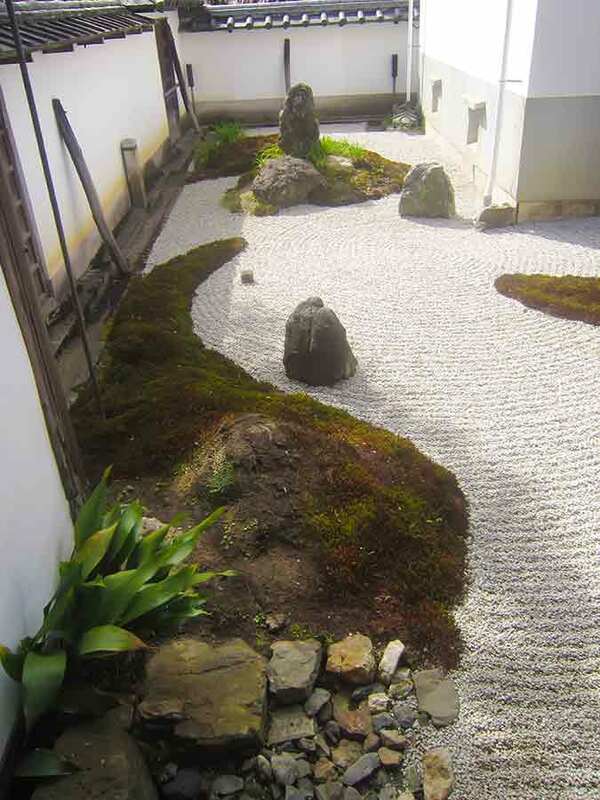 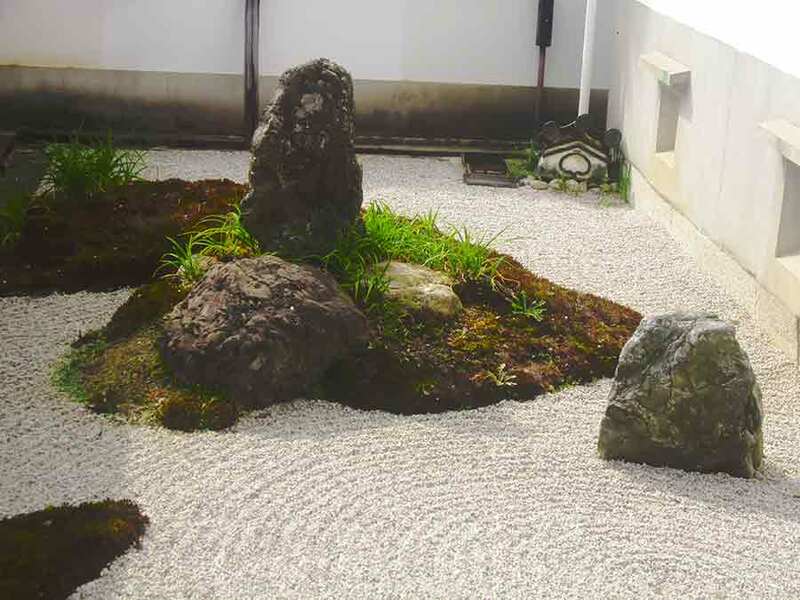 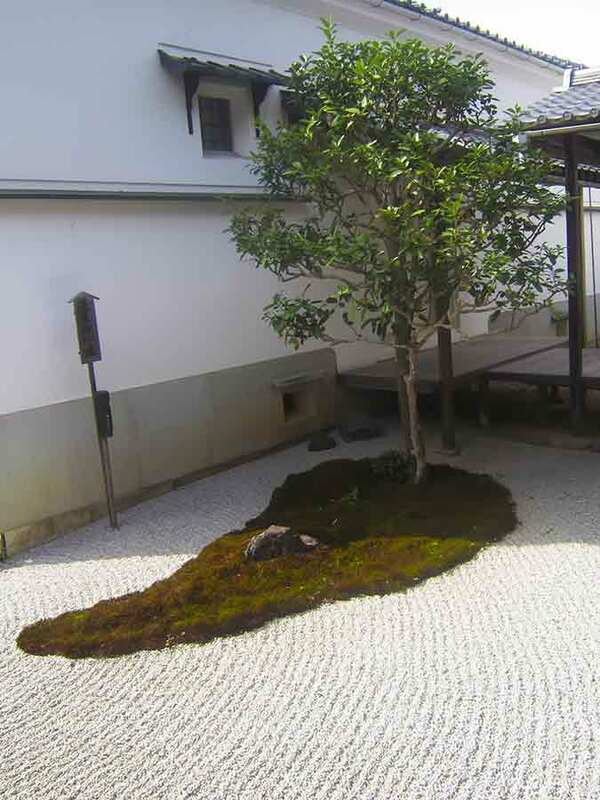 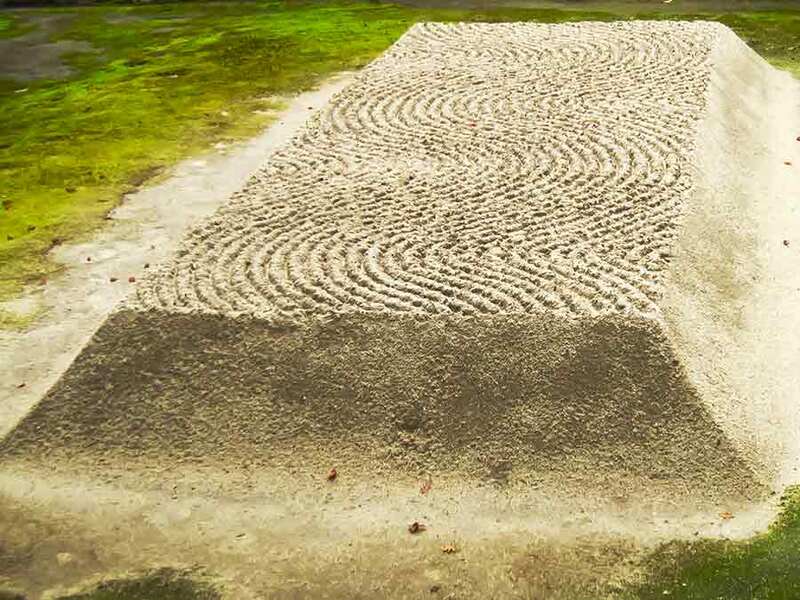 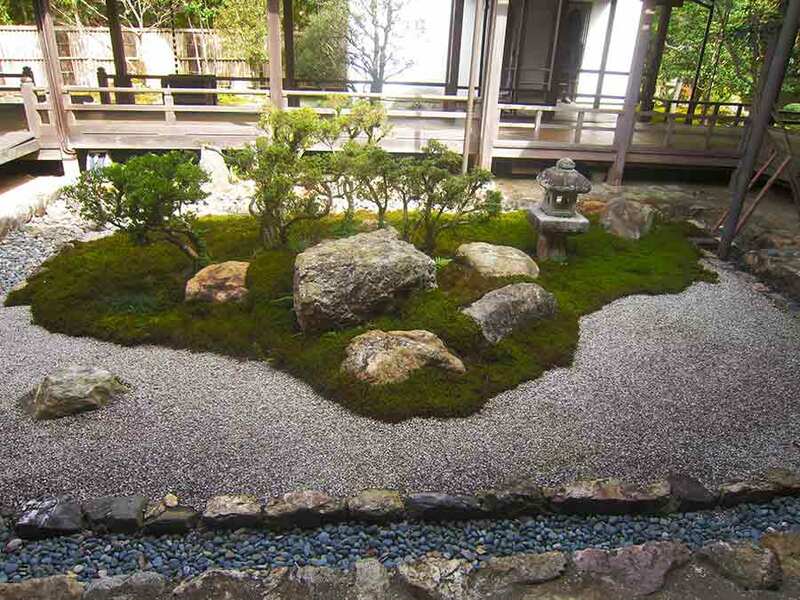 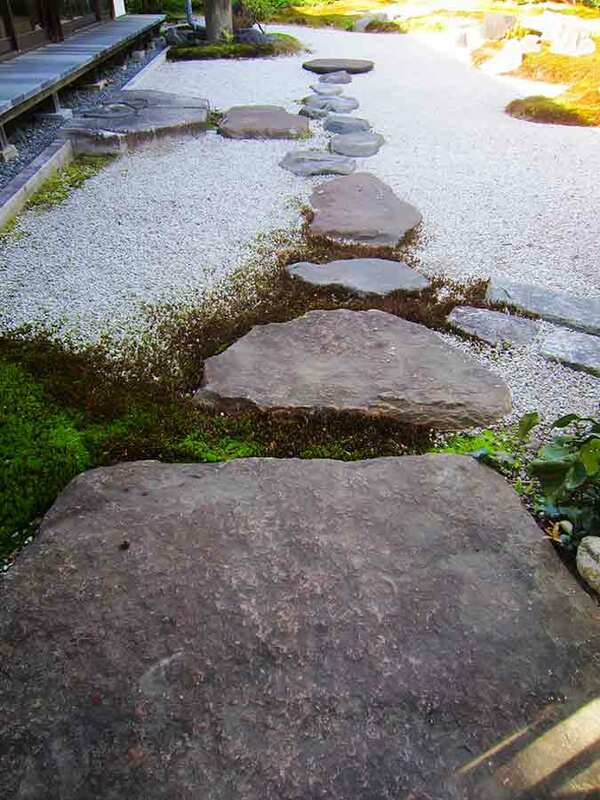 Zen gardens with their gravel patterns are usually the first association people have when thinking about Japanese gardens. 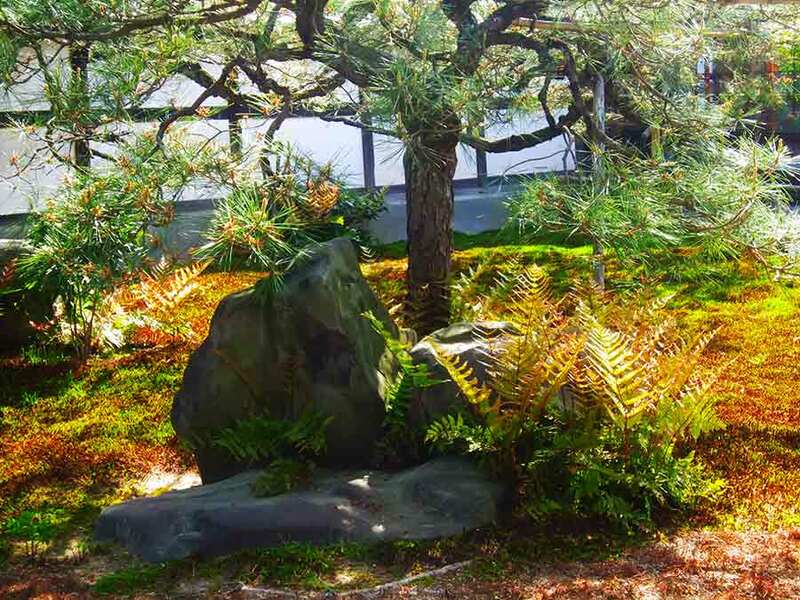 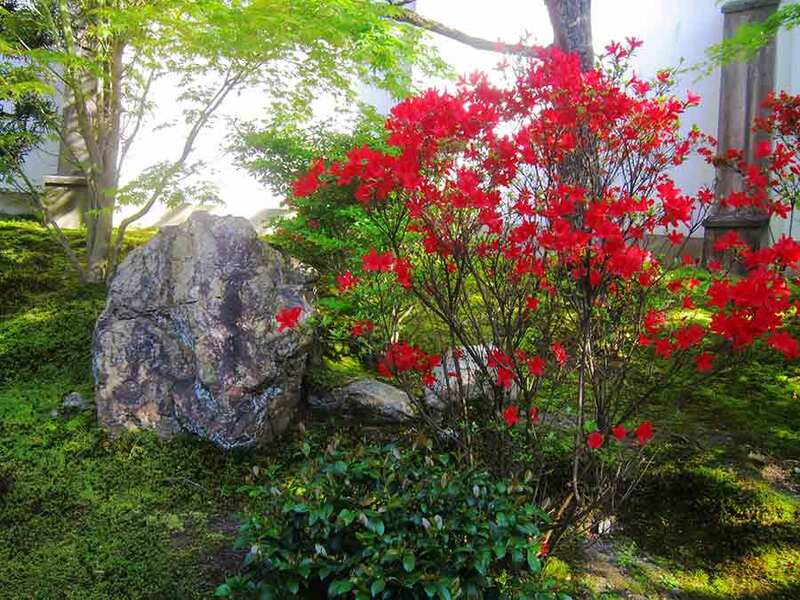 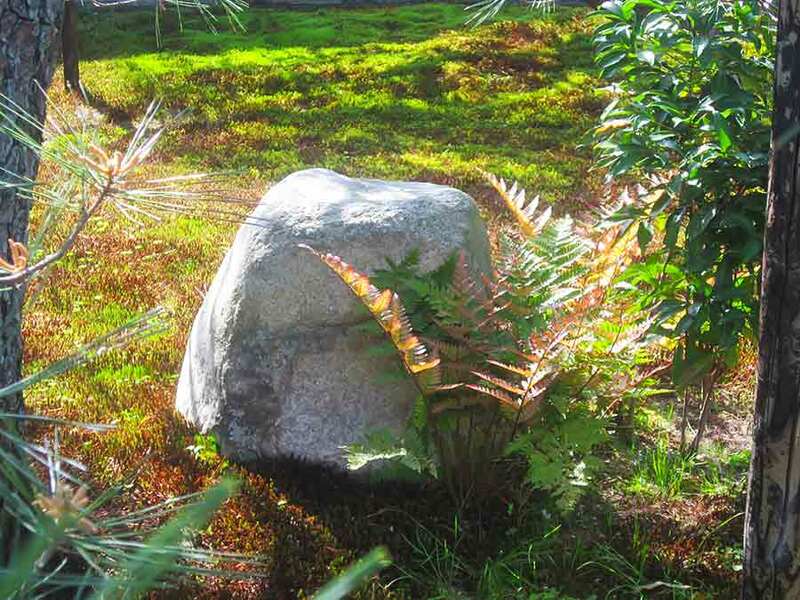 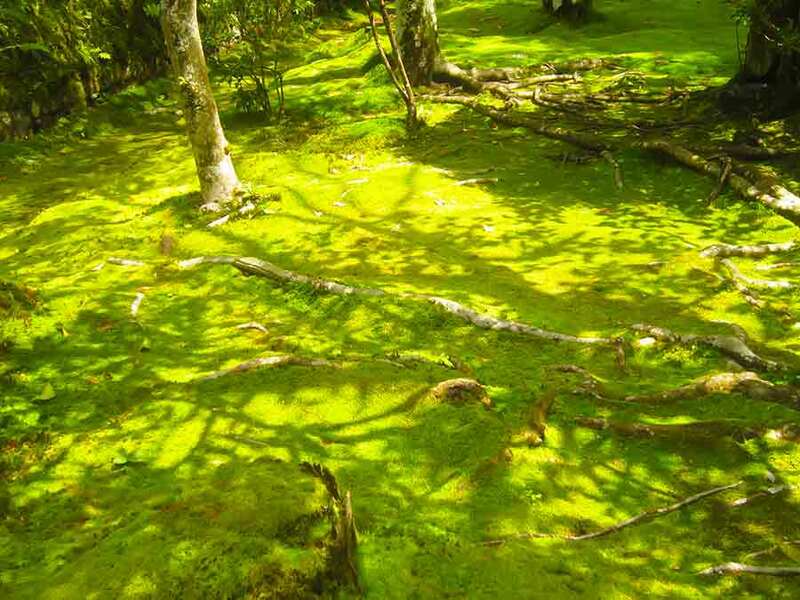 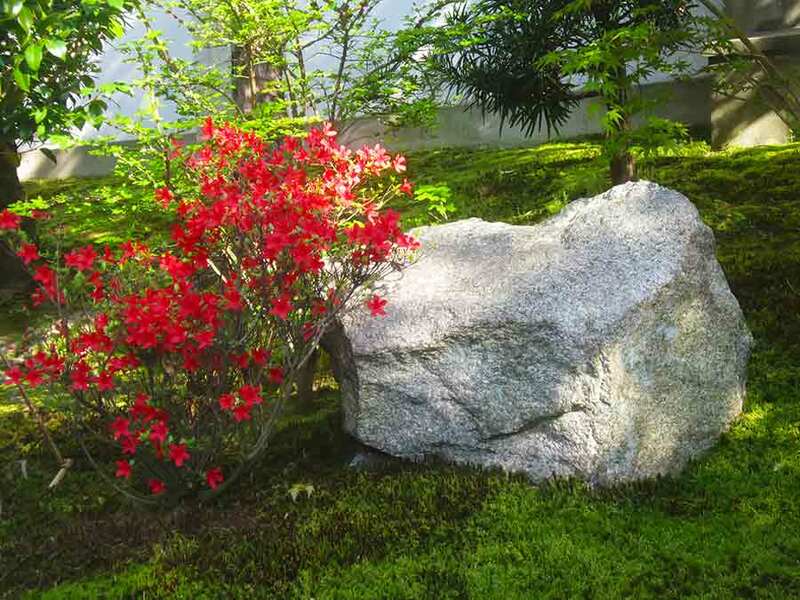 Reduced colors and little vegetation let the eye rest and calm the mind, giving the garden a peaceful atmosphere. 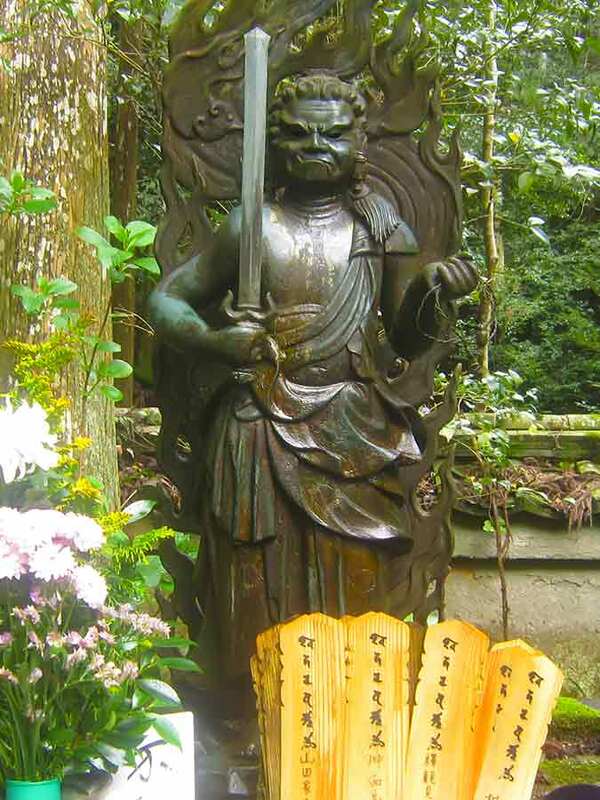 which we tend to think of as visual renderings of satori, the state of enlightenment. 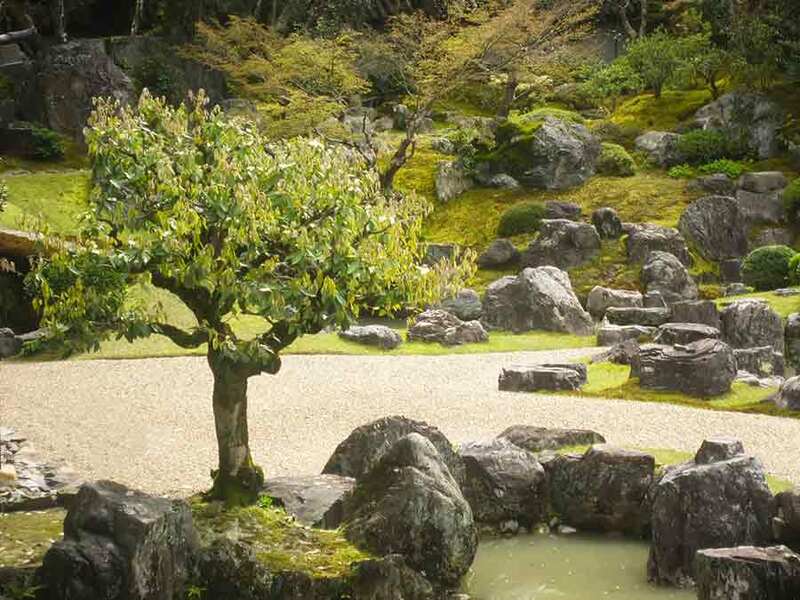 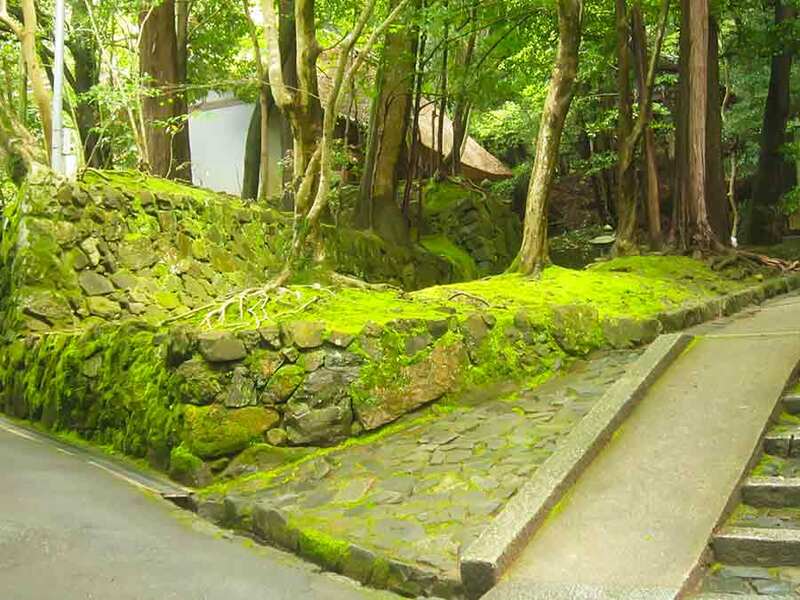 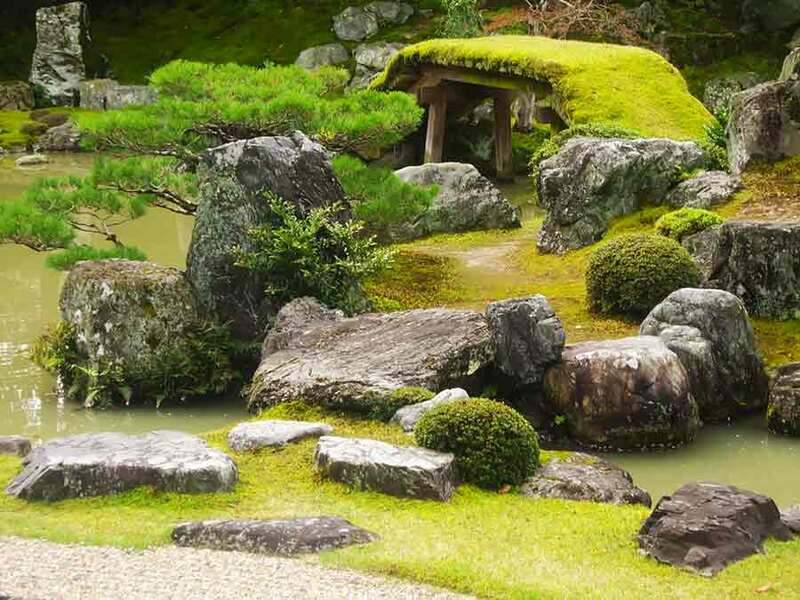 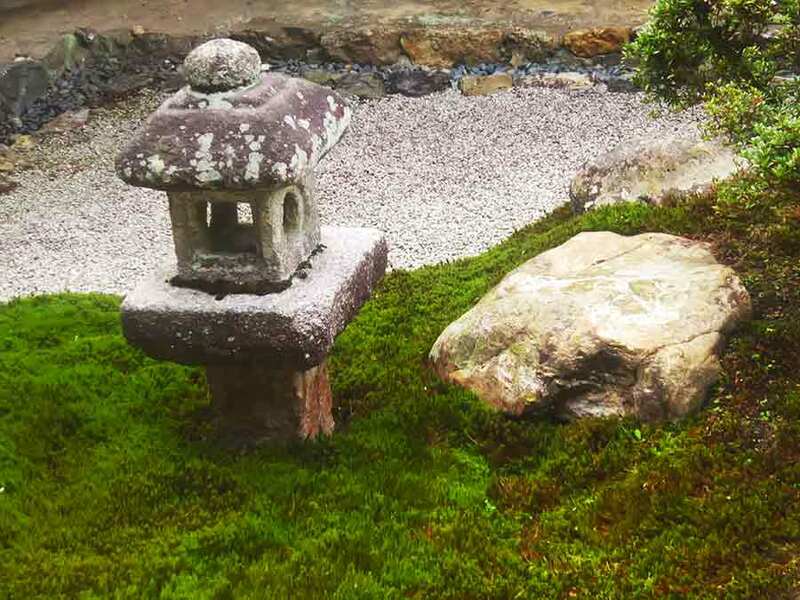 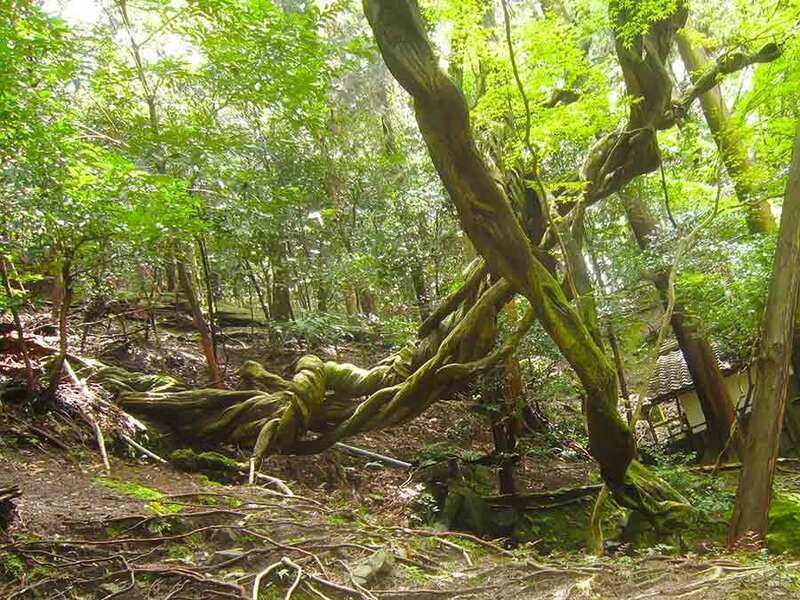 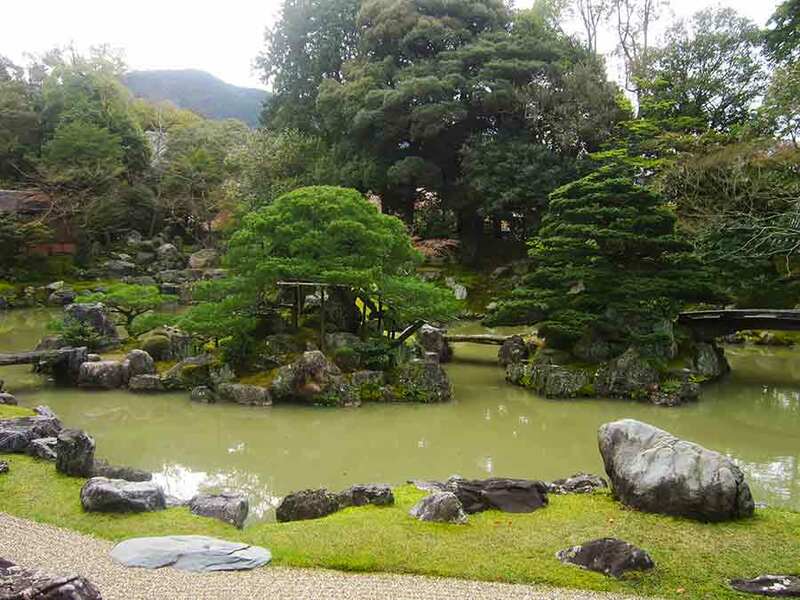 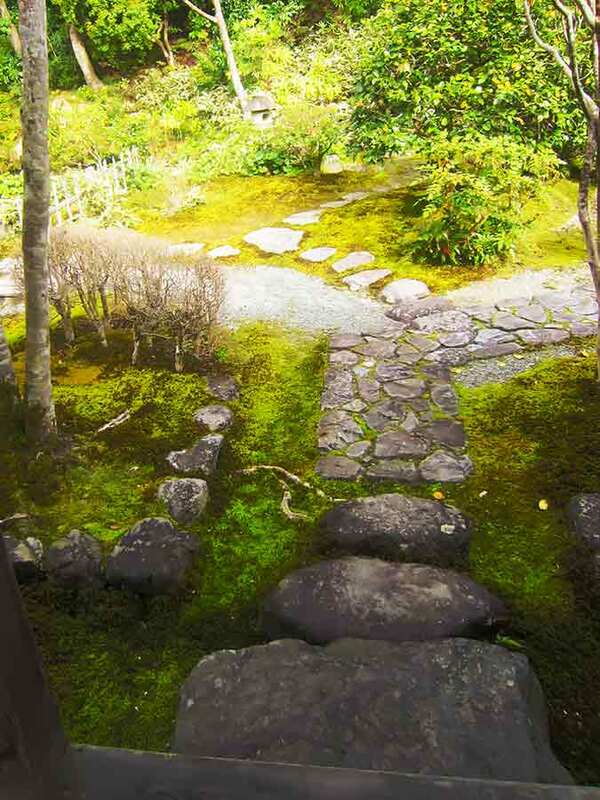 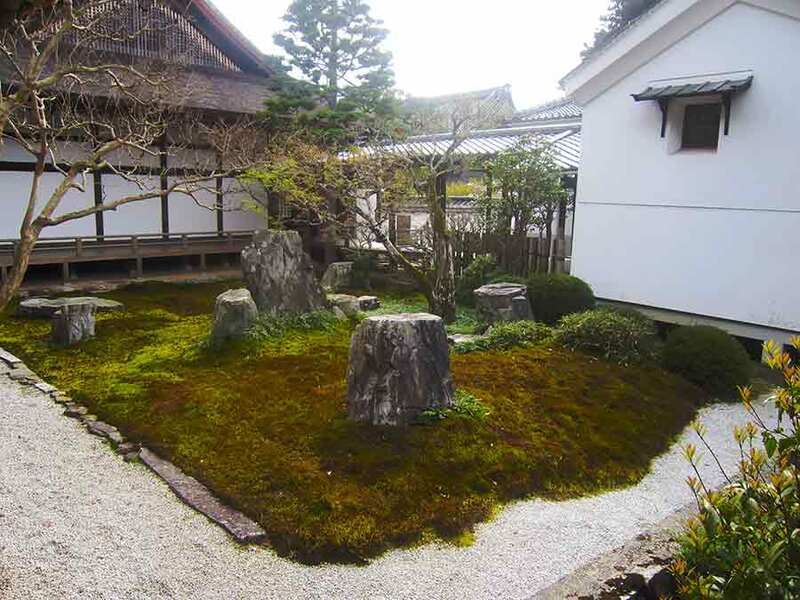 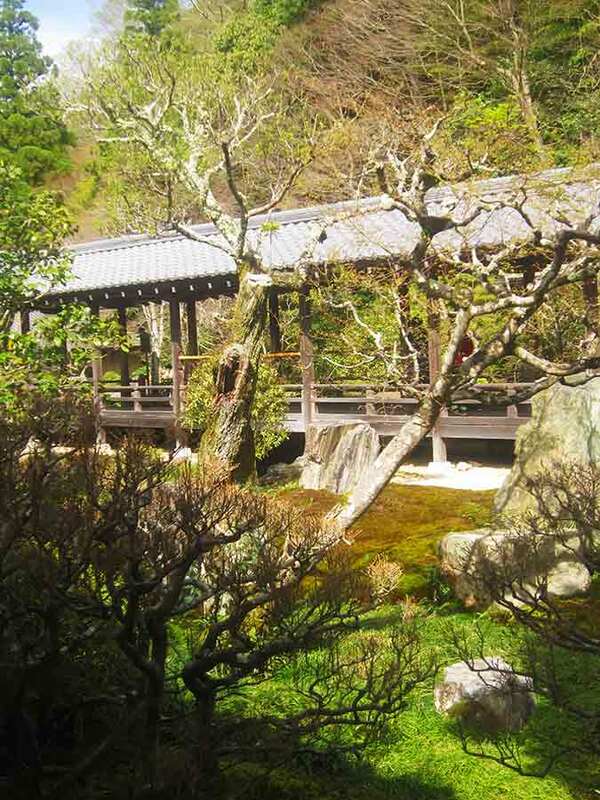 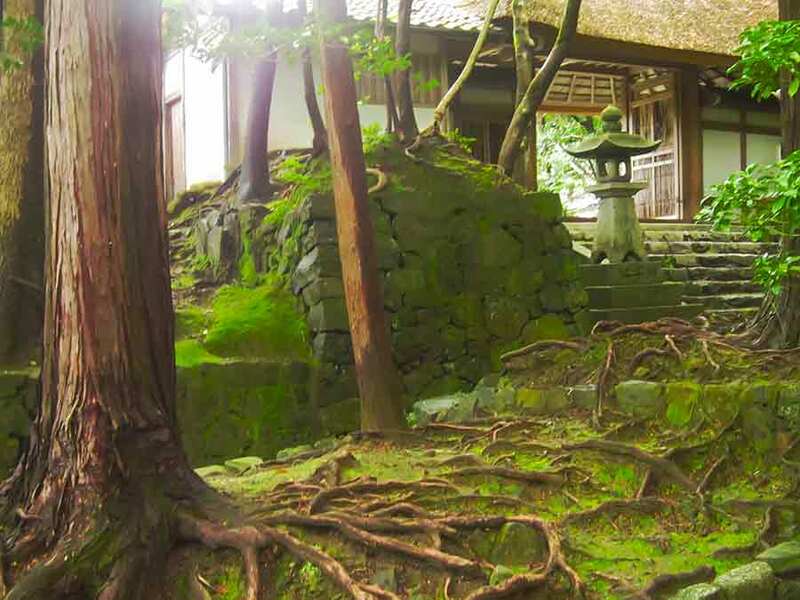 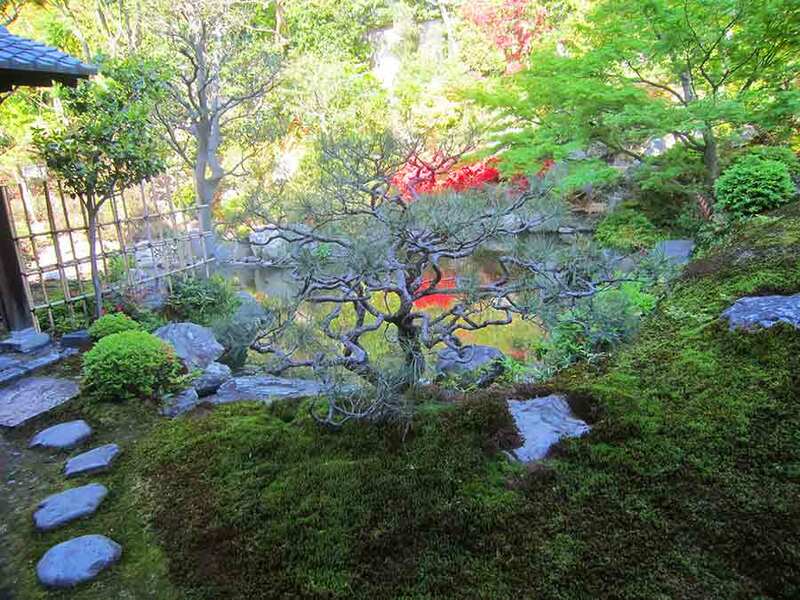 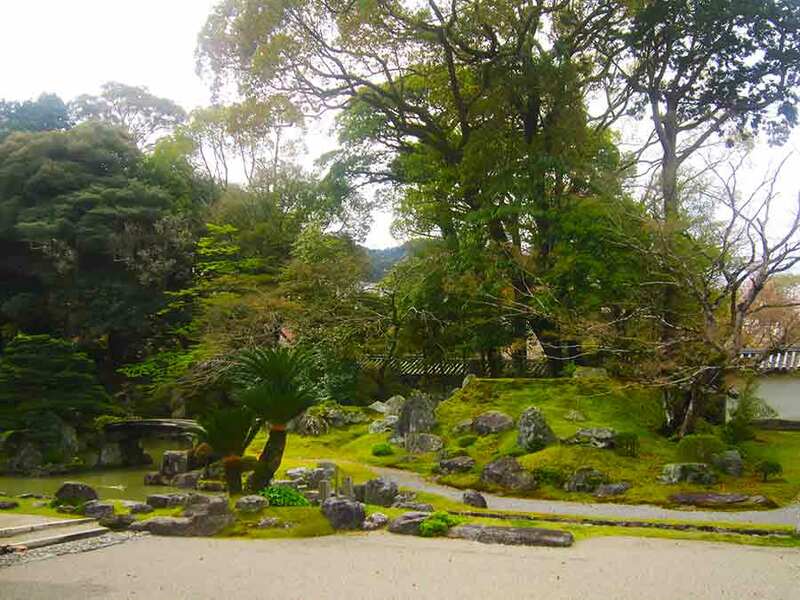 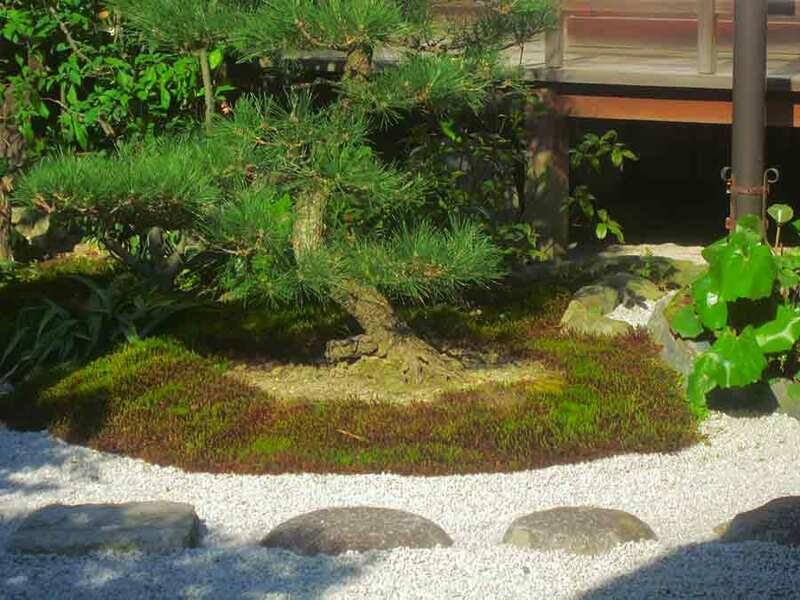 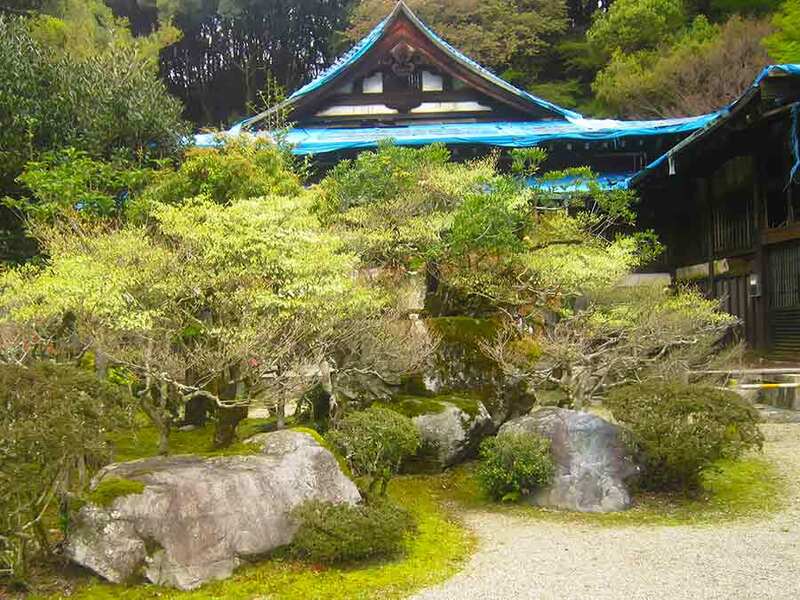 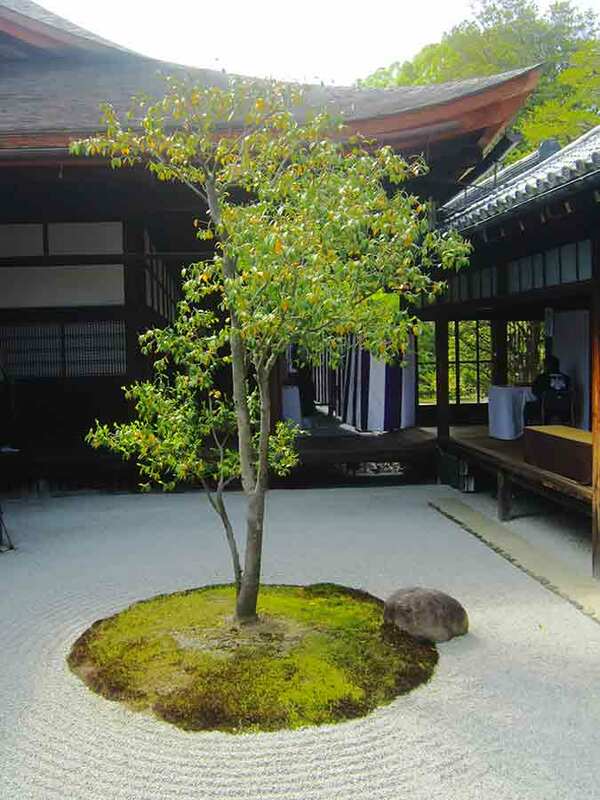 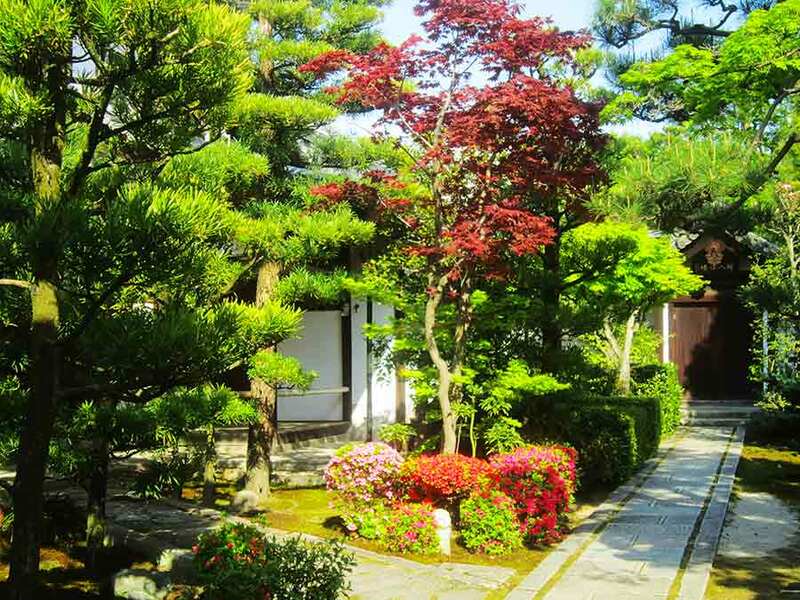 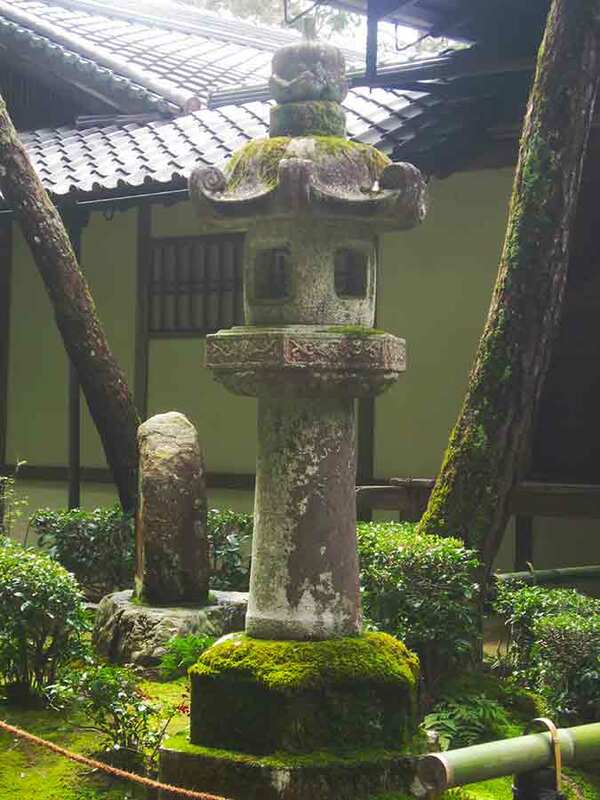 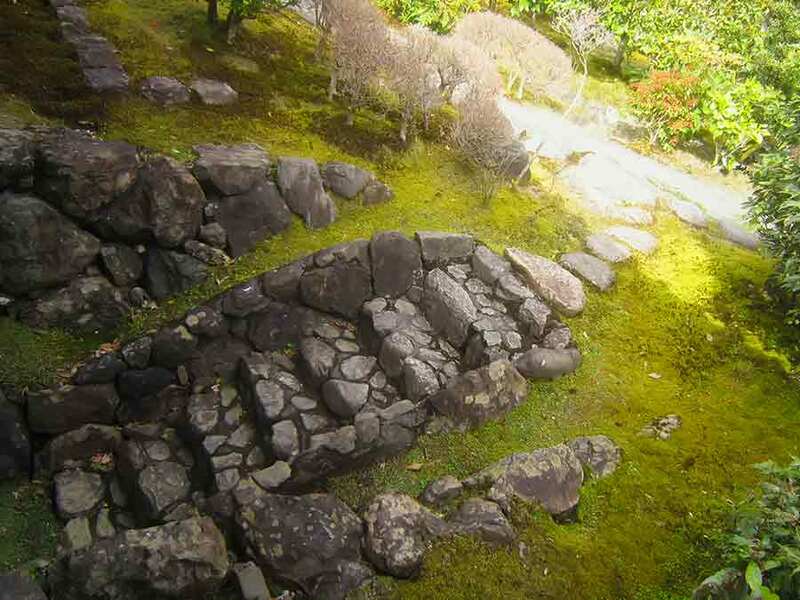 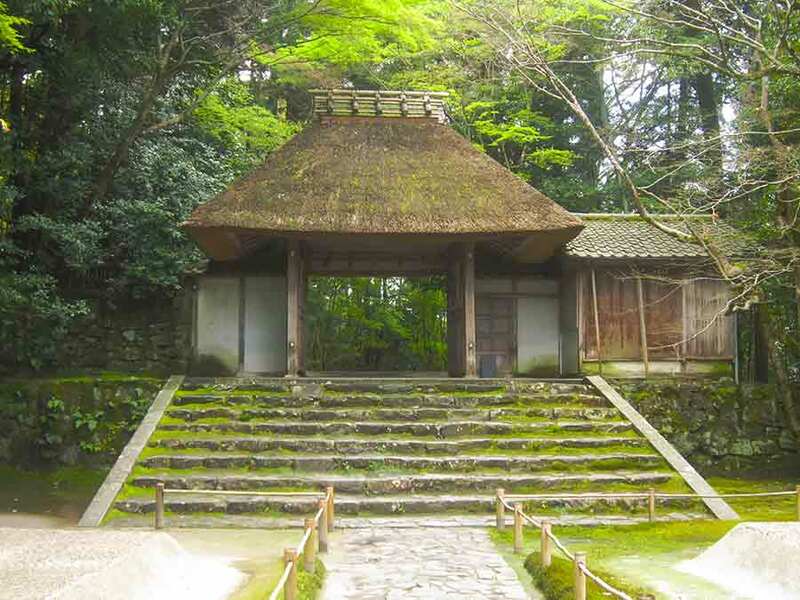 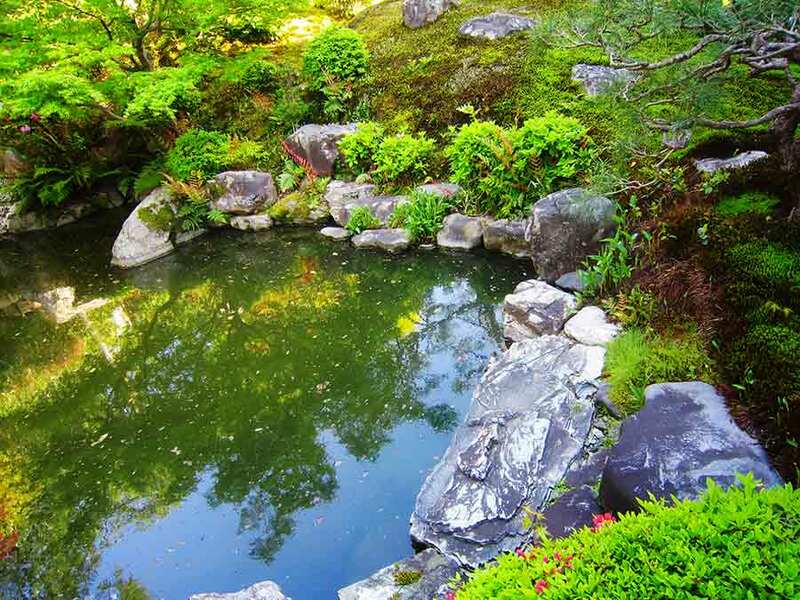 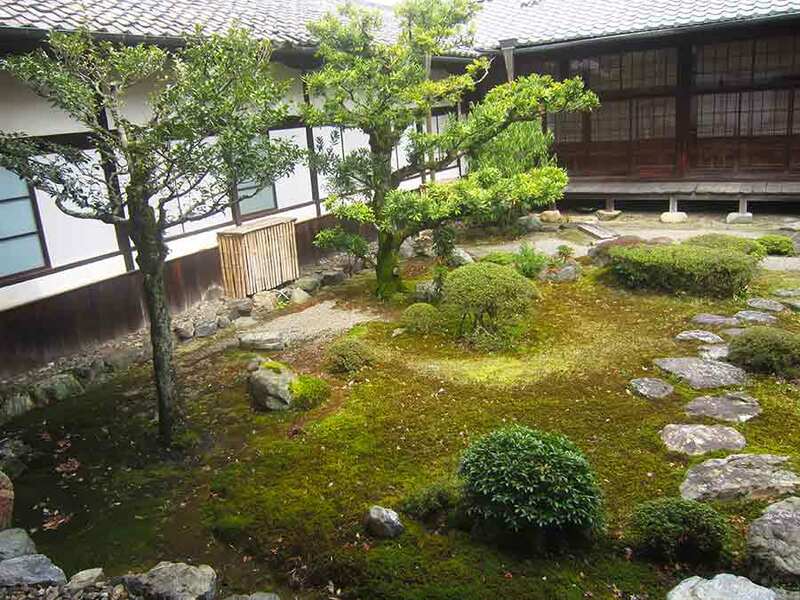 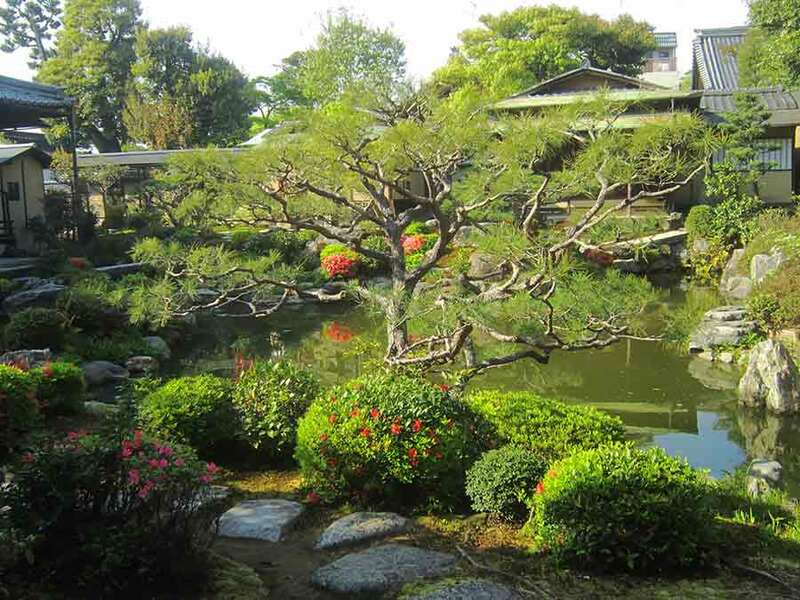 is the oldest Zen Temple in Kyoto. 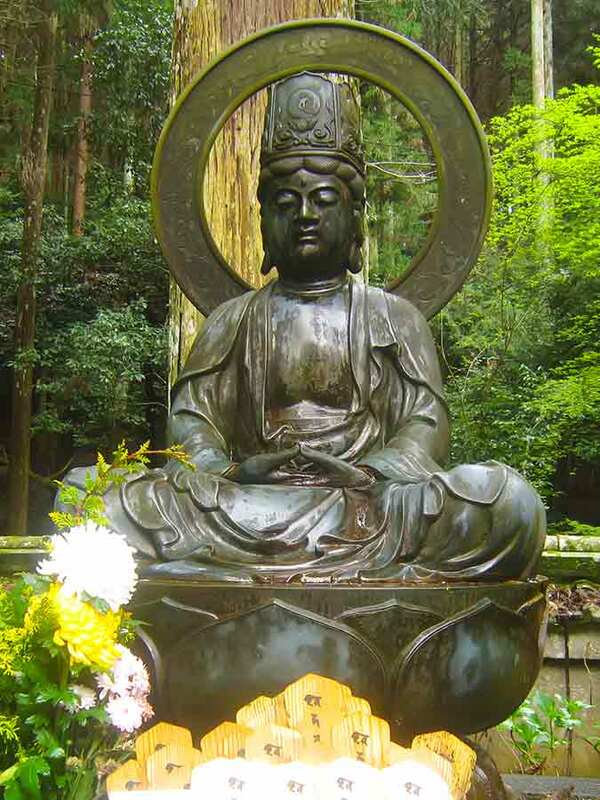 teaches that the inherent suffering of life can be transcended through equanimity, wisdom and compassion. 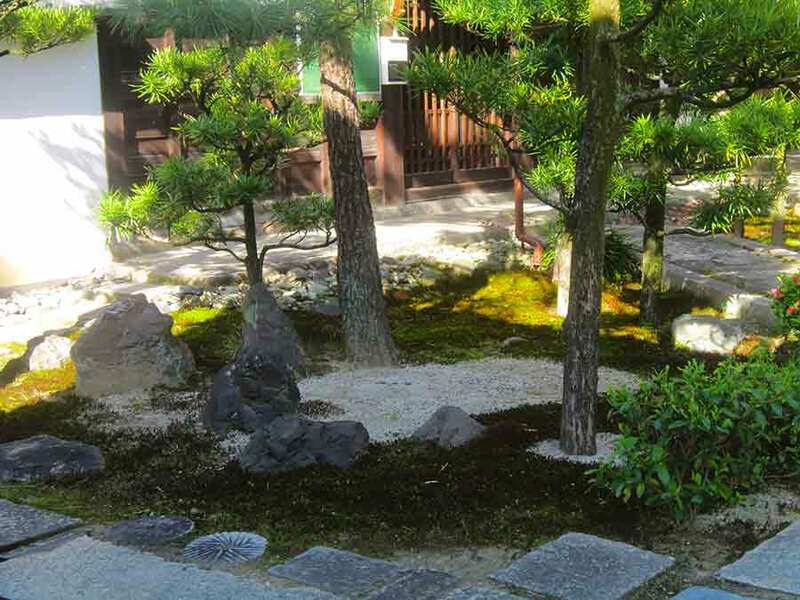 Gardening plays important role in teaching. 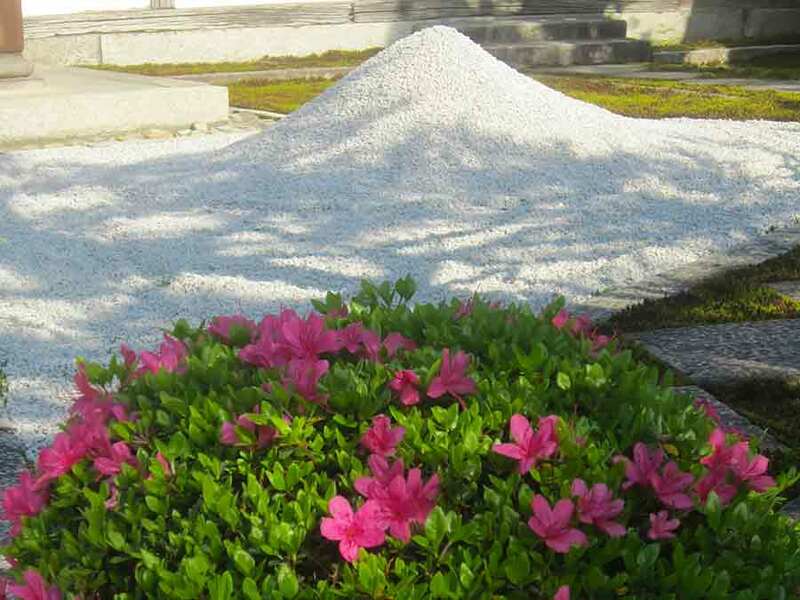 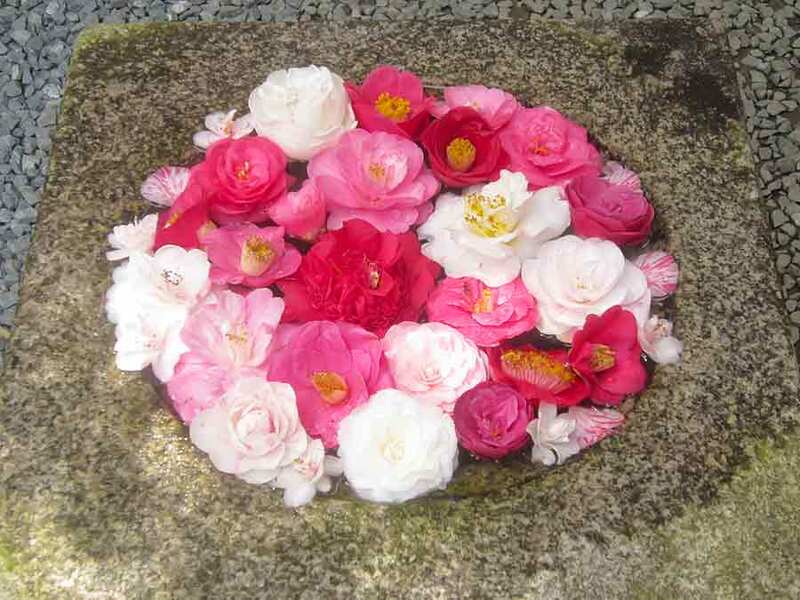 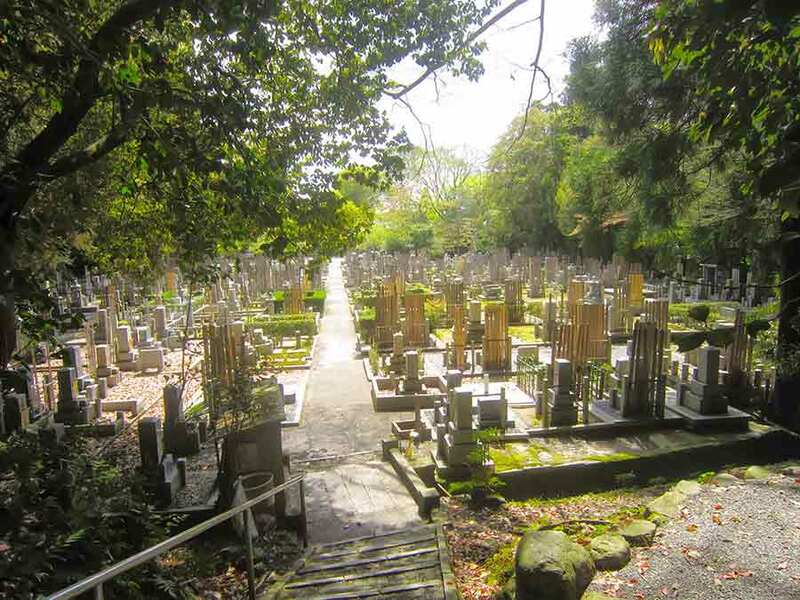 "The garden of the sound of the tide" is full name of Kennin-ji. 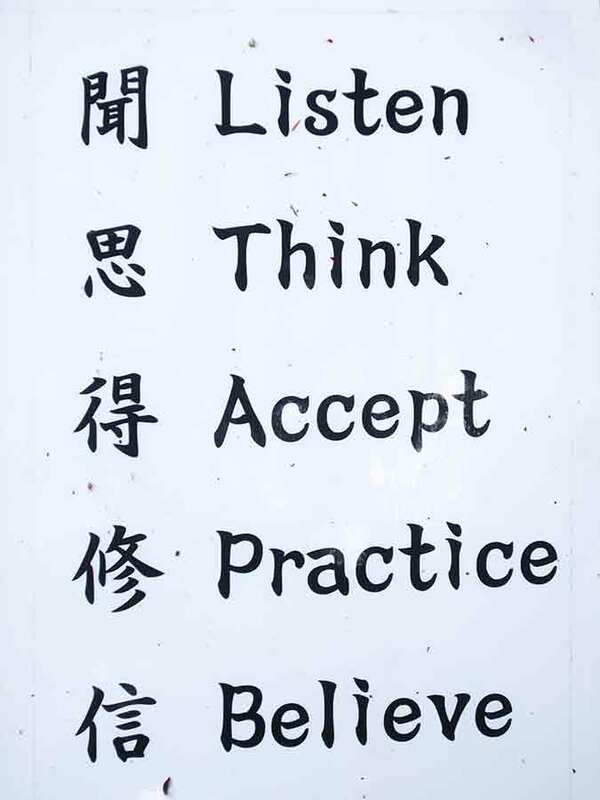 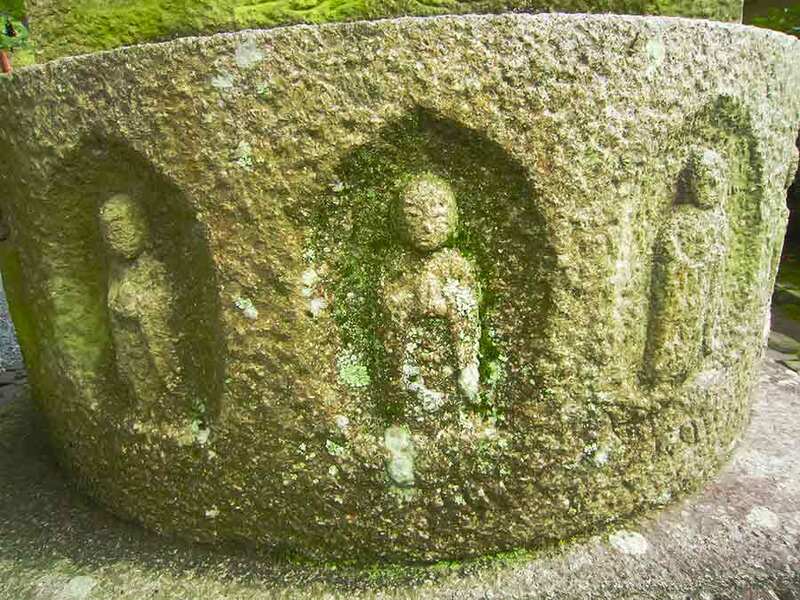 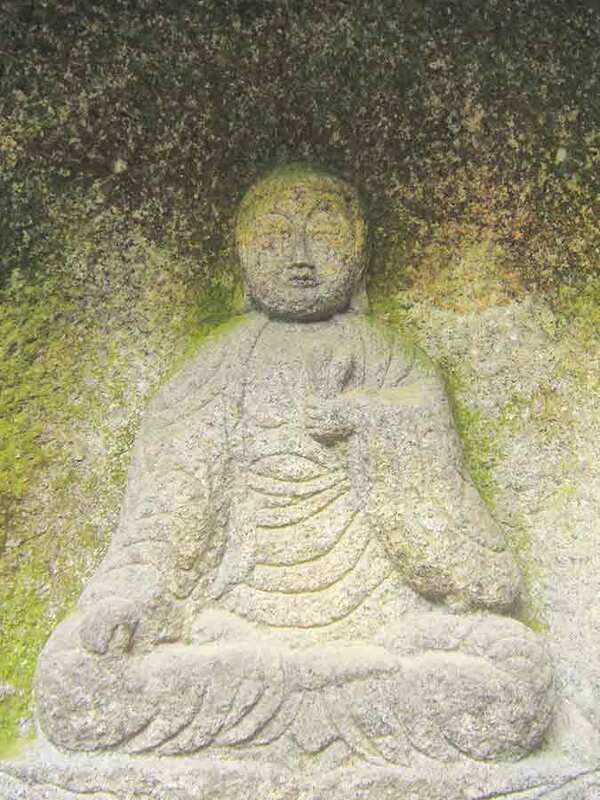 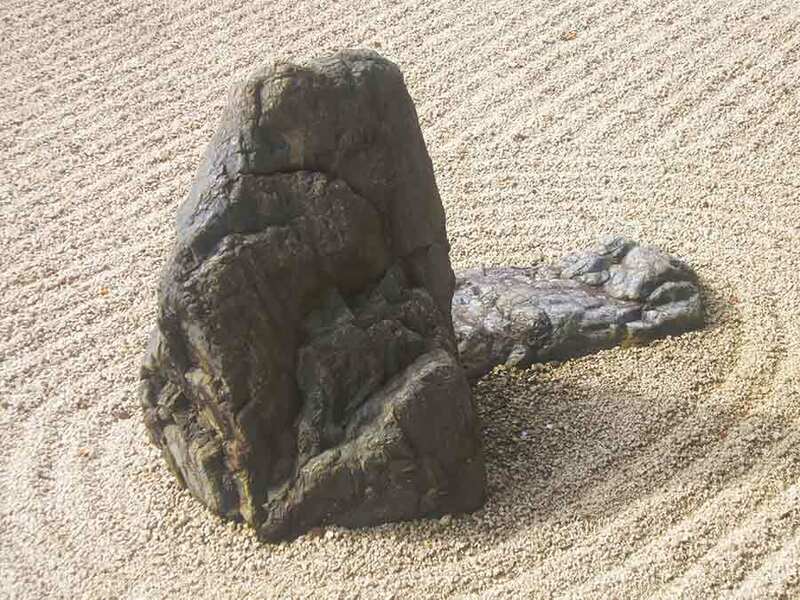 A set of three stones represent Buddha and two Zen monks. 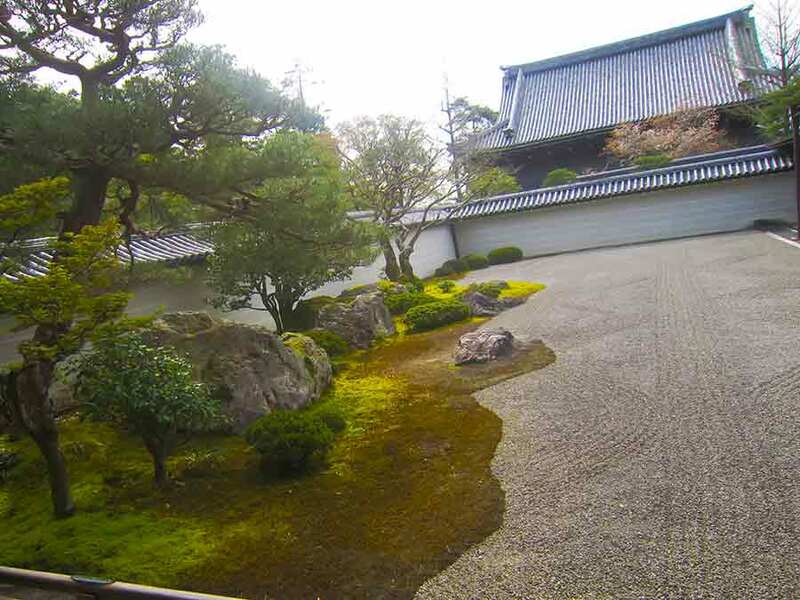 Square garden is in front of the priests living quarters, abbots quarters and reception room. 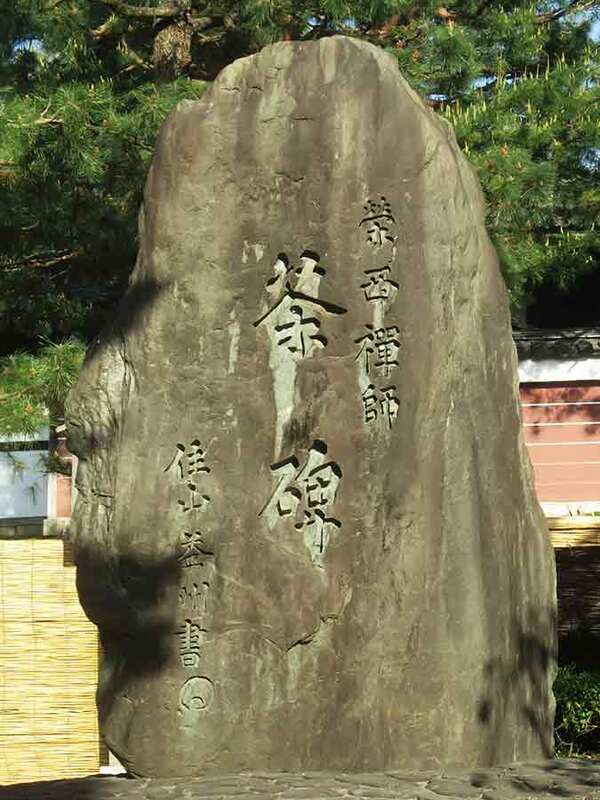 Design is based on the famous calligraphic work. 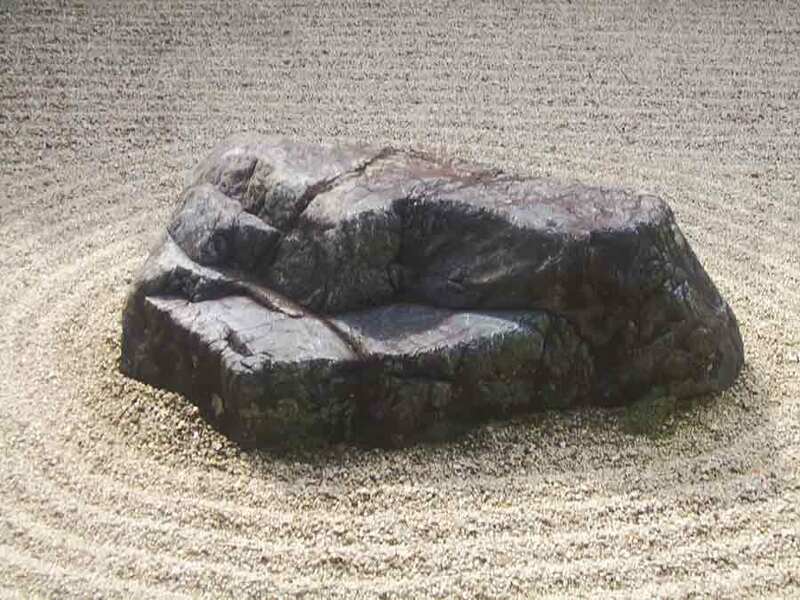 The idea behind the "circle, triangle, square" is that all things in this universe are represented by these forms. 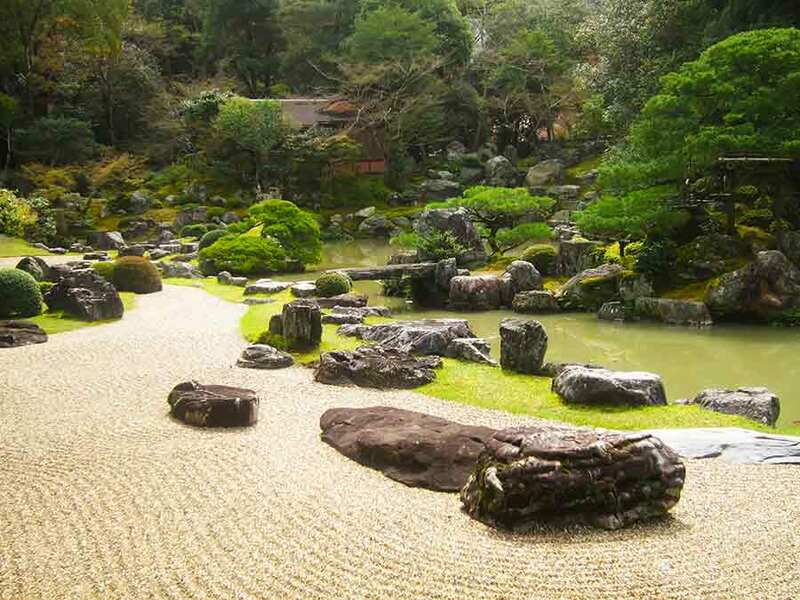 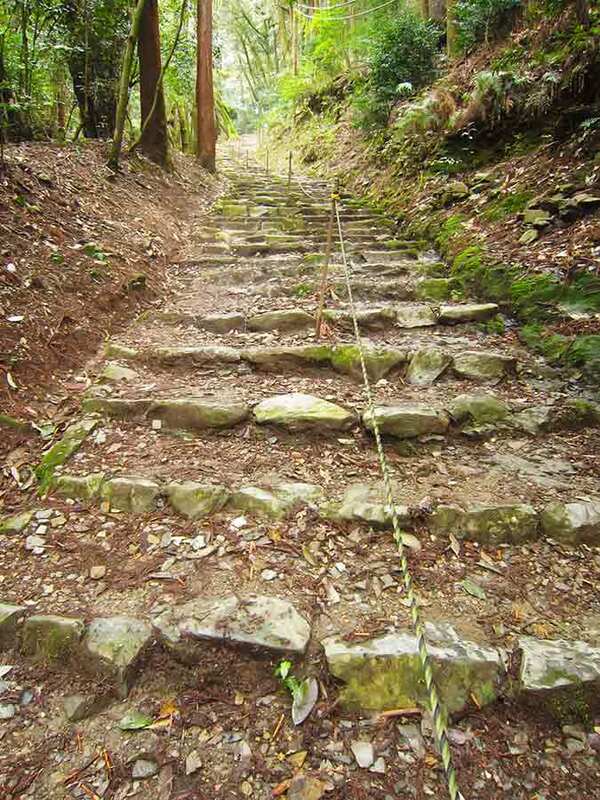 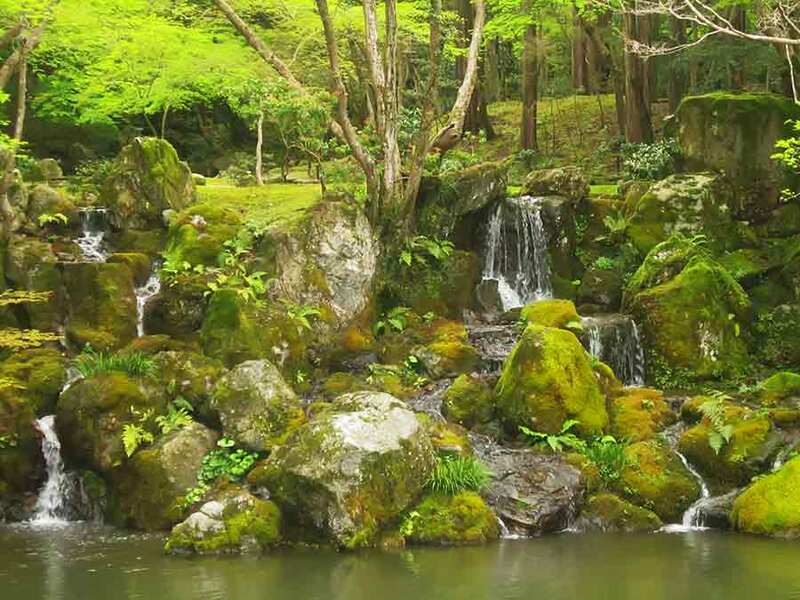 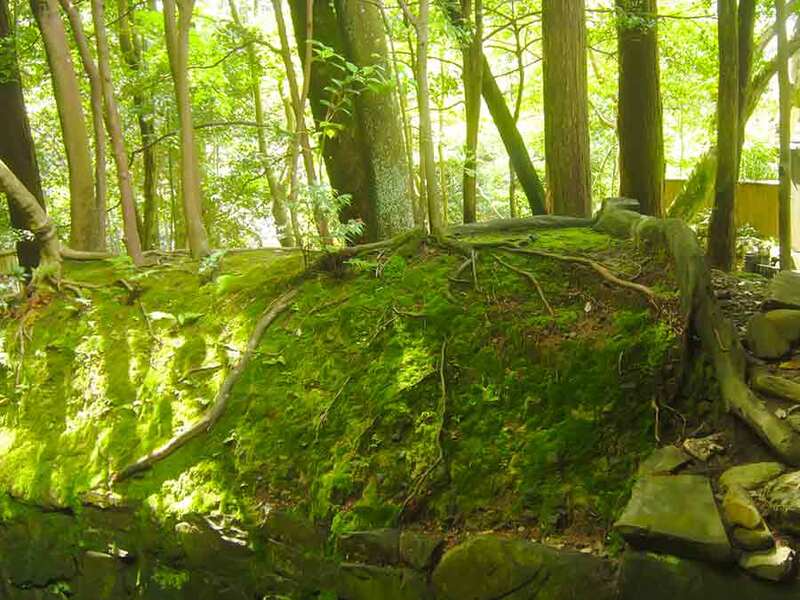 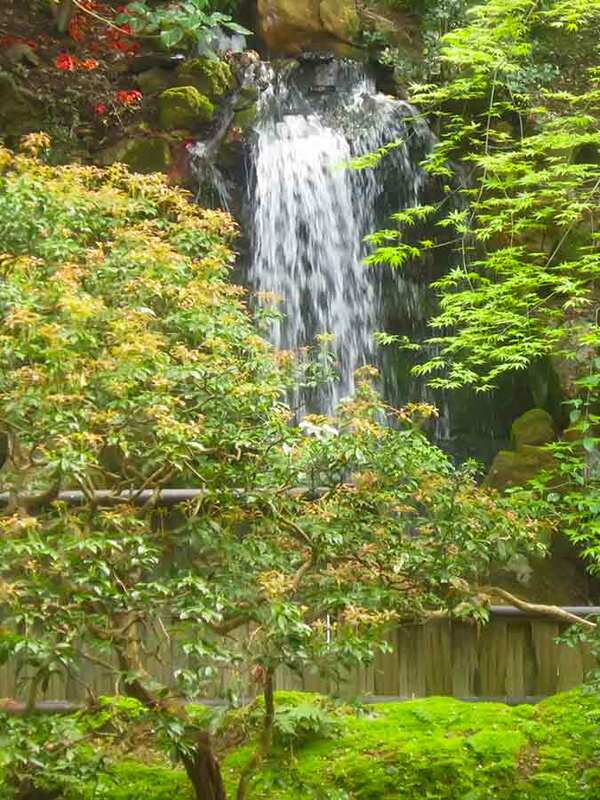 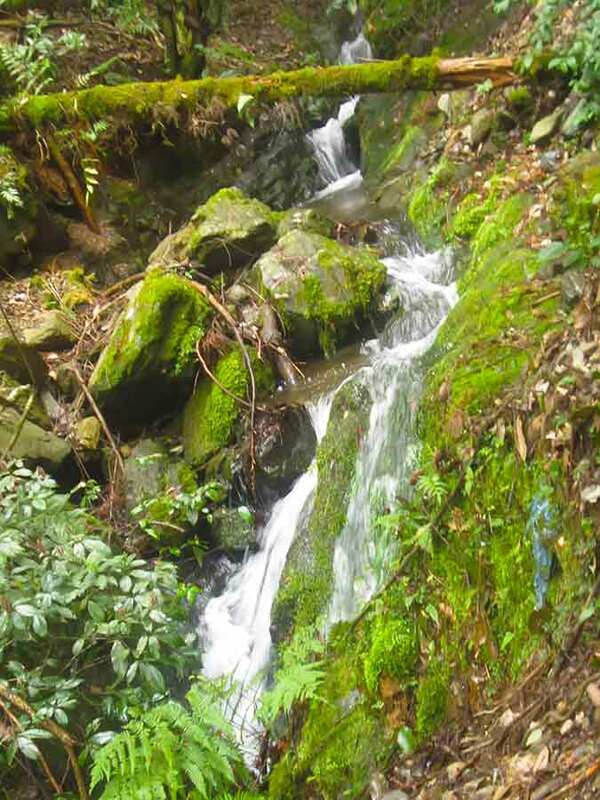 is best known for its rock garden, the rock as they say resemble tigers and their young flowing through the water. 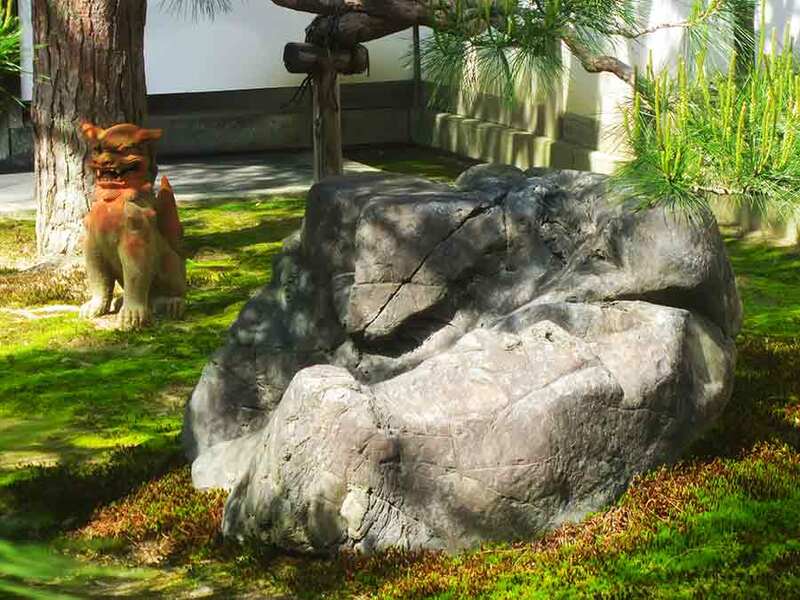 Also highly valued are paintings on fusuma (sliding door), which include more realistic illustration of tigers on the golden leaves. 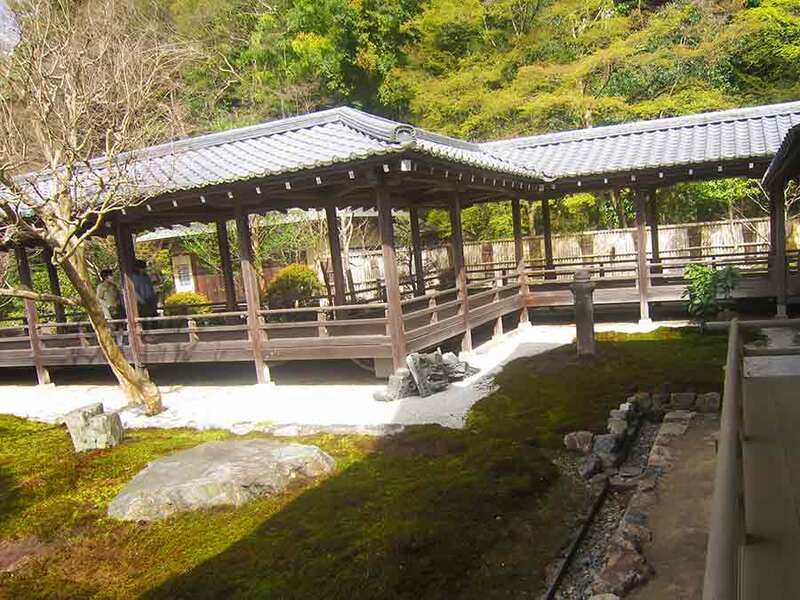 Visitors enter the complex of buildings Hojo by the former kitchen of the temple, where you can also find a small tea house overlooking a miniature waterfall behind the window. 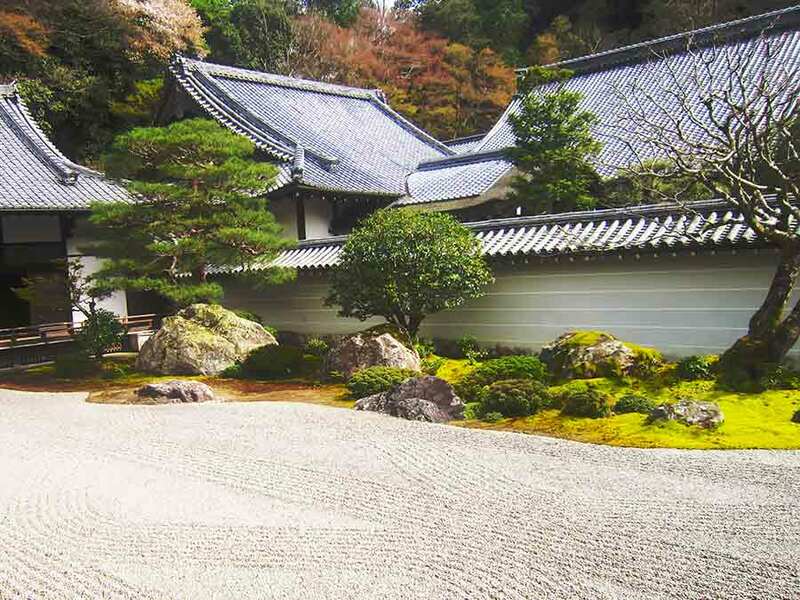 Located in eastern Kyoto, Daigoji Temple is a UNESCO World Heritage site and the location of a hanami party organized by warlord Toyotomi Hideyoshi in the 16th century. 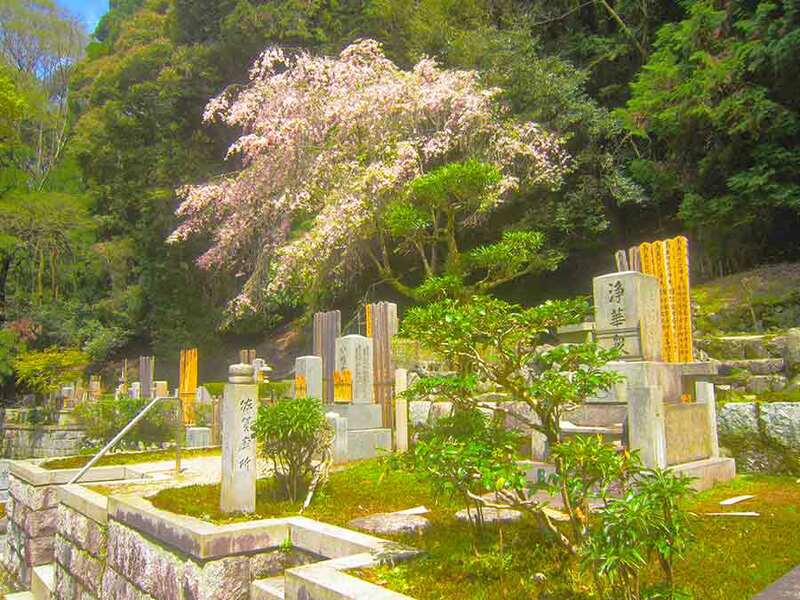 Daigoji is known for its weeping cherry trees in the Sanboin Garden. 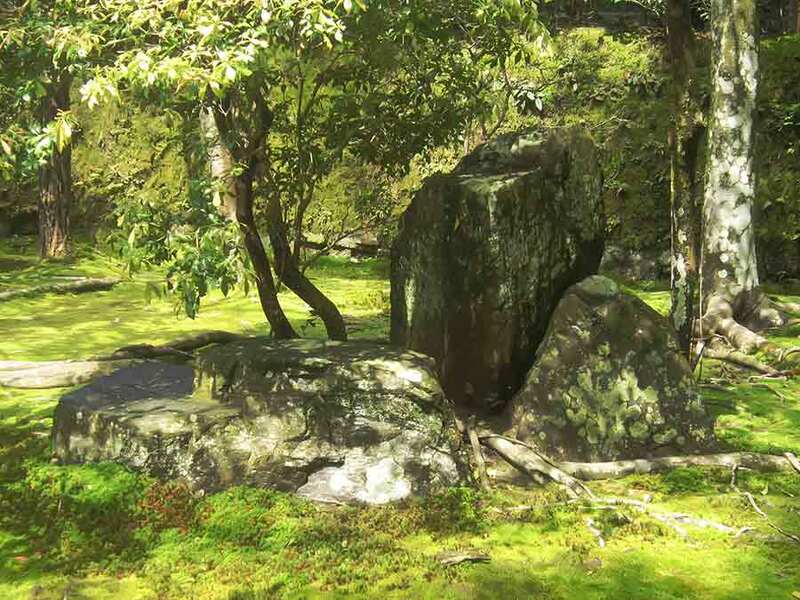 Starting from a incredibly picturesque approach that ends up in the moss covered gate, Honen-in works its magic on the visitors from the start. 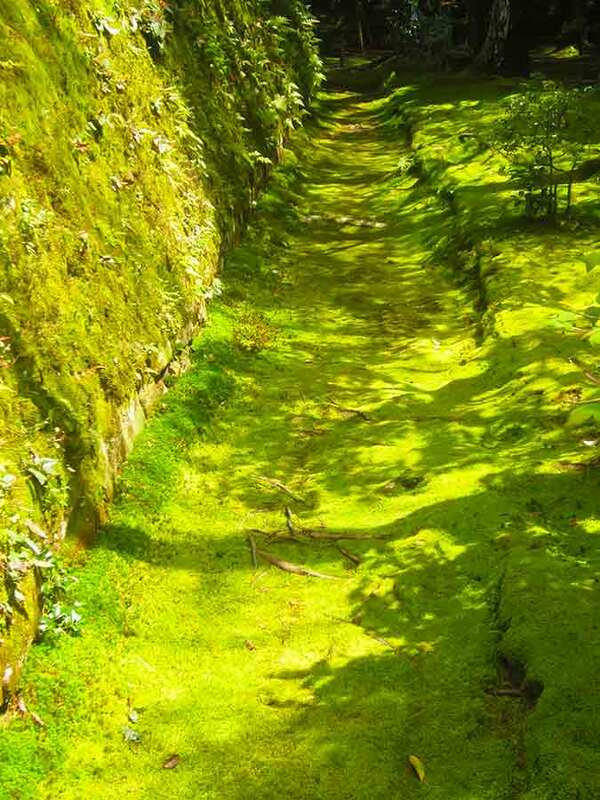 Once inside you pass a beautiful stone bridge over a pond where carp swim, followed by a garden covered with moss to find yourself at a secret cave behind the main lobby. 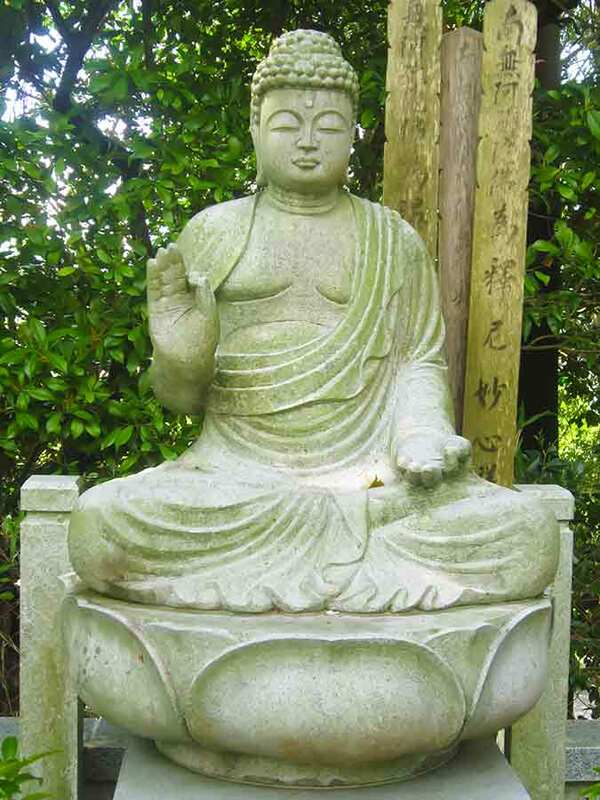 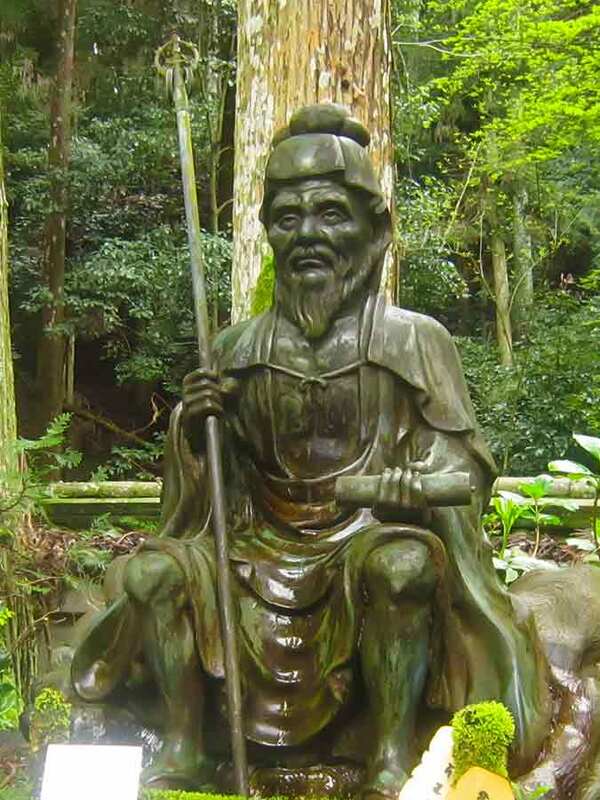 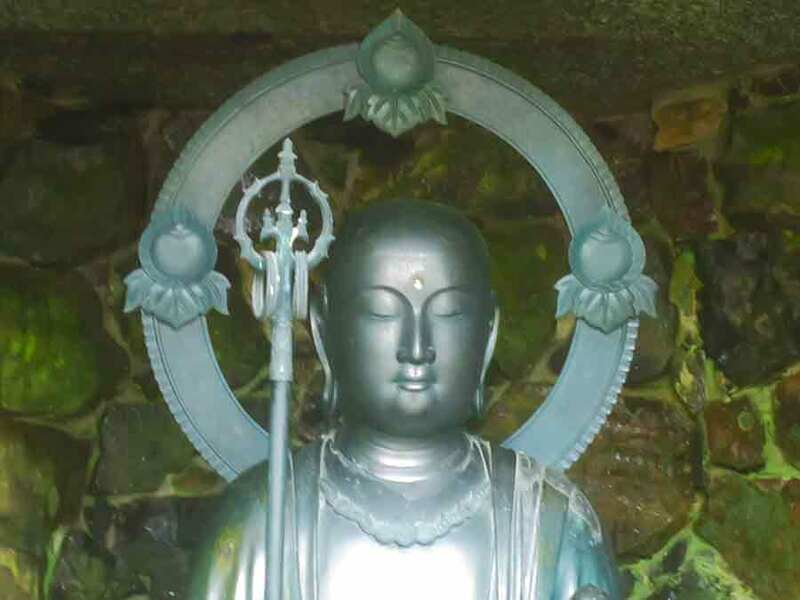 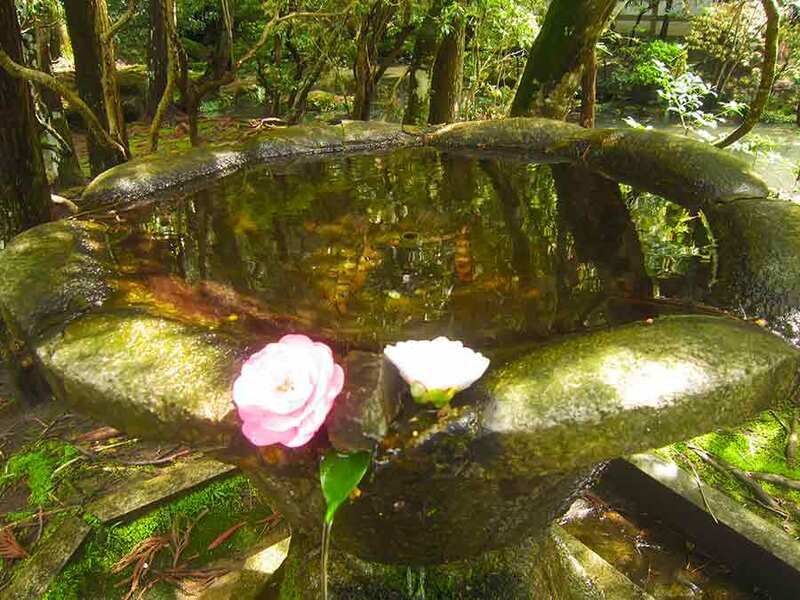 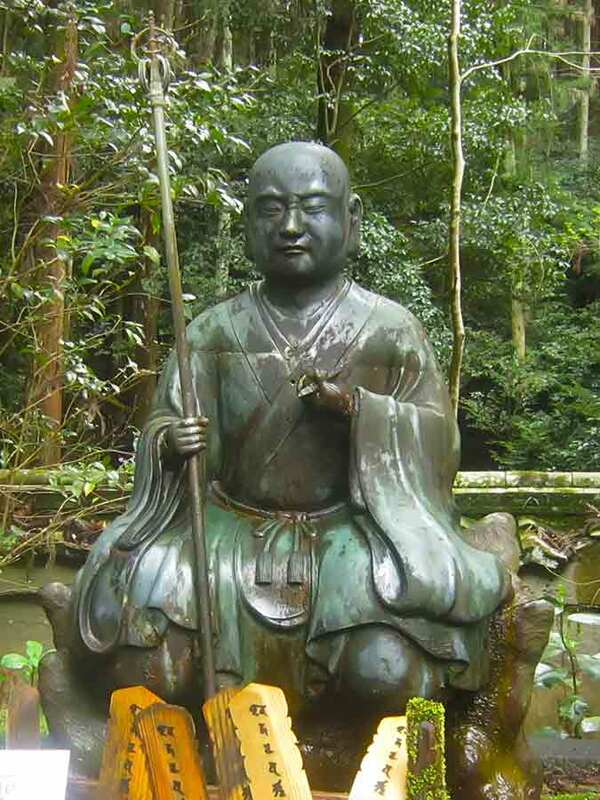 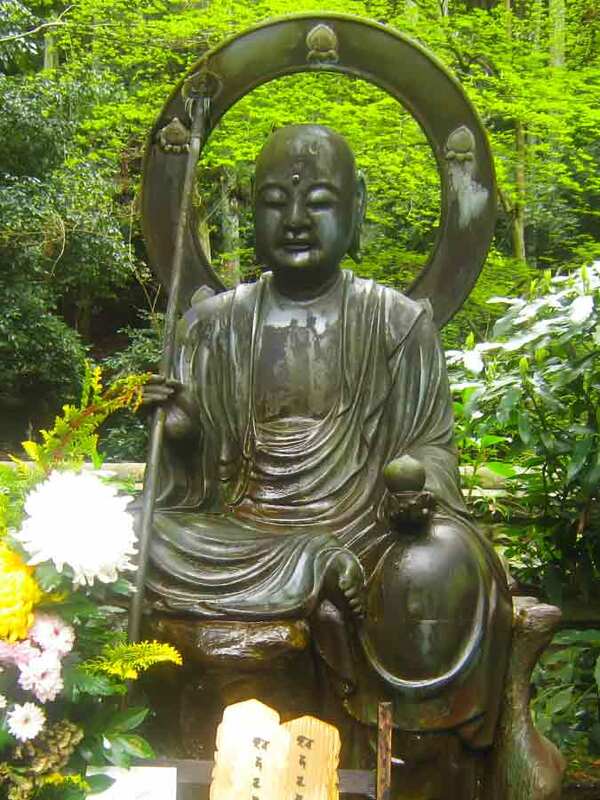 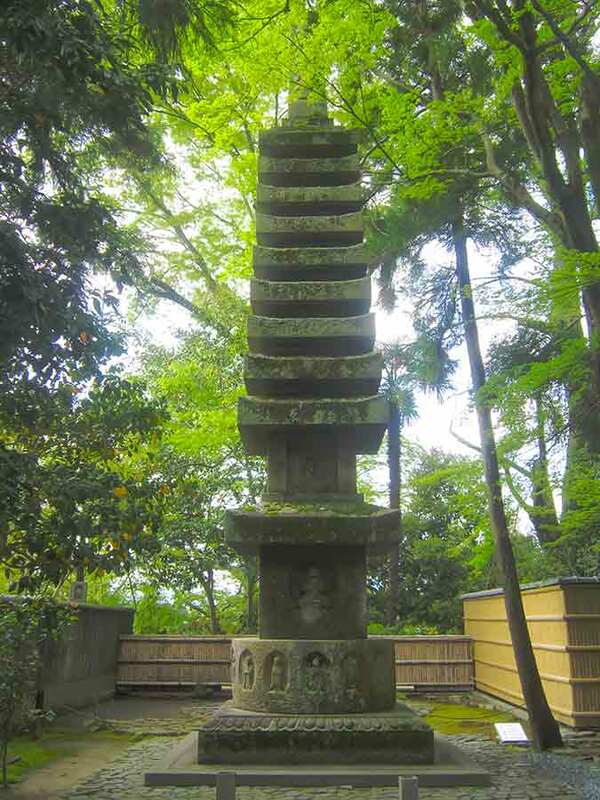 The shallow carp pond is crossed by low bridges and at the back of the temple to your right is a fine statue of Jizo.